Technically speaking, last week’s episode was a bit of a filler episode for this season, since we didn’t get a whole lot of season arc plot and it had a (failed) gimmicky premise. But this week takes the cake for filler-ish episodes, and without even a ladies-centric plot or a Drunk Barry Allen to make up for it! Nope — instead, we have an episode revolving around Ralph Dibny, who is simultaneously repellant and uninteresting and I don’t really get why the writers decided to add him onto the team. He’s a sleazy, hedonistic, self-centered person who has to learn how to be a hero and, oh my — where have I seen that exact variety of overdone character before? Hey, TV writers: find some different archetypes, please. I am begging you. Hedonist-to-Hero redemption arcs are so, so, so boring. Even though this episode is called “When Harry Met Harry” we don’t actually see a lot of Harrison Wells or the other versions of himself. He calls forth a very Rick and Morty-esque Council of Wells by bringing together Harrison Wells variations from three different parallel Earths, since Harry can’t make friends and he thinks the smartest people to brainstorm with are... him. They’re meant to be discussing the problem of DeVoe but they can’t stop bickering amongst themselves long enough to formulate anything resembling a plan, and Harry realizes that he actually hates himself too much to get along with these parallel versions. Also very much reminiscent of Rick from Rick and Morty. Have the Flash writers been binge-watching? I like this sequence because Tom Cavanagh is hilarious as the four different versions of Harrison Wells — Harry, a lothario Harrison Wells, an intellectual German Harrison Wells, and a cyborg Harrison Wells with a touch of the Mad Max — but I don’t quite understand why something like this wasn’t saved for a different episode, where it could maybe stand out a bit more and get fleshed into a real character piece for Harry, maybe with some bonus Cisco character growth thrown in. 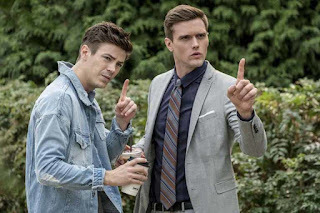 I know I’d definitely prefer to see Harry’s character development over Ralph Dibny’s, not only because Harry is a character who has been around long enough for me to care about his development, but also because he has a much more unique archetype as the cynical/jaded, no-nonsense, genius mentor who has to learn how to be a regular person with regular relationships and new realizations about himself as an individual, beyond the scope of his work. As it stands, the thread that gives the episode its title barely counts as a B-story. 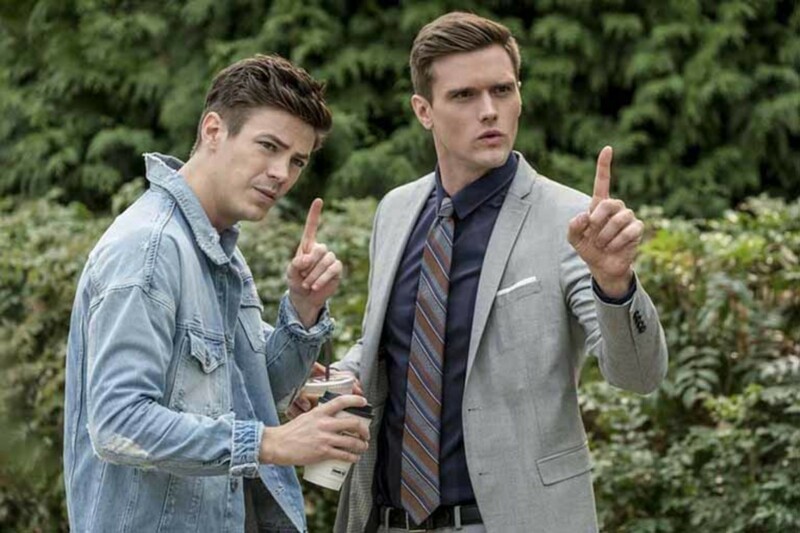 Meanwhile, in the main part of the episode, Barry is basically babysitting Ralph Dibny because yeah, that’s what you want from an up-and-coming hero. The necessity of a person with morals to follow him around and make sure his borderline sociopathy doesn’t hurt innocent civilians. Why was Wally written out of this show to make room for Ralph Dibny, exactly? Ralph and Barry almost get mugged, but Dibny’s rubberized existence makes him bulletproof and every time he’s shot, the bullet bounced right back at the robber. I will say one thing positive about the Dibny storyline: it allows for a lot more snark from Barry, which is highly entertaining. That’s pretty much it, though, since Dibny constantly proves himself to be inappropriate and gross and really not all that cut out to be a self-sacrificing hero. I know he’s supposed to have been much transformed by the loss of his job as a detective, but I really can’t believe his personality shifted so completely, so I think this must just be who Dibny is and always will be. Uhg. I do not look forward to this character arc. Aside from almost getting mugged, Barry and Dibny (and Iris) take a trip to the therapist Iris and Barry used so that Dibny can get hypnotized into remembering who else might have been on that bus that got hit by dark matter. They have to do this because Cisco is prevented from using his Vibe powers to see the incident, which sounds like something of a cop-out for the writer... But I’ll allow it, since at least they brought up the possibility before writing themselves out of using it. Ralph gets hypnotized and sees a bison patch on a person’s jacket, and that person is our metahuman of the week, Black Bison, whose real name is Mina Chaytan. Mina is of Sioux descent and has taken a turn from her former occupation as a professor in order to work in activism regarding the reacquisition of Sioux artifacts from museums, which is a nice way of saying she steals things. This has only been helped by her newfound power to bring effigies to life, from tiger statues to suits of armor, and use them to kill the people who stand in her way. I wish The Flash hadn’t so clearly drawn the line with Black Bison by making her a killer. It’s very easy for Barry (and the writers) to say, “she killed people, she’s evil, she goes to jail” and be done with it, especially since the morality and righteousness of her mission makes me sympathize a lot more with her than with Ralph Dibny, who spends the entire episode having to be told that human life is more important than the “win” of catching the bad guy. It would have made a far more interesting story if the show had introduced as a “hero” with an already-skewed moral compass, who then has to wade through the morally gray quagmire of a Sioux woman stealing artifacts that rightfully belong to her people. As it stands, making Mina/Black Bison an outright murderer takes away the intriguing grayness of her mission and oversimplifies things for Dibny’s sake and for the sake of the viewers. The show trades a compelling story about the scale of right and wrong for simplified black-and-white, and also wastes the tiny amount of potential that having a character with an awful personality and terrible ethics might bring to the table. In the end, we get a sloppy, simple lesson that protecting people is important (duh-doy) and killing people is bad (duh-doy, squared). Because, yes, Barry and Dibny stop Black Bison’s murder-slash-righteous-theft spree and lock her up with the other bus metas that turned out more evil than good. Considering that Black Bison’s final hurrah was to (awesomely) bring a T-Rex skeleton to life, though, I was still kinda rooting for her. The Thinker is revealed to be DeVoe! We already knew this, of course, but Barry et al. finally caught up. Cisco’s lesson to Harry is "no one's gonna like you if you don't like yourself first” and suddenly the fact that I have any friends at all is a miracle. I do really like this season’s increased number of scenes of Barry doing his actual CSI job, as opposed to just sitting in dark offices and angsting.